The invention discloses a method for preparing a compound as shown in the formula (I). 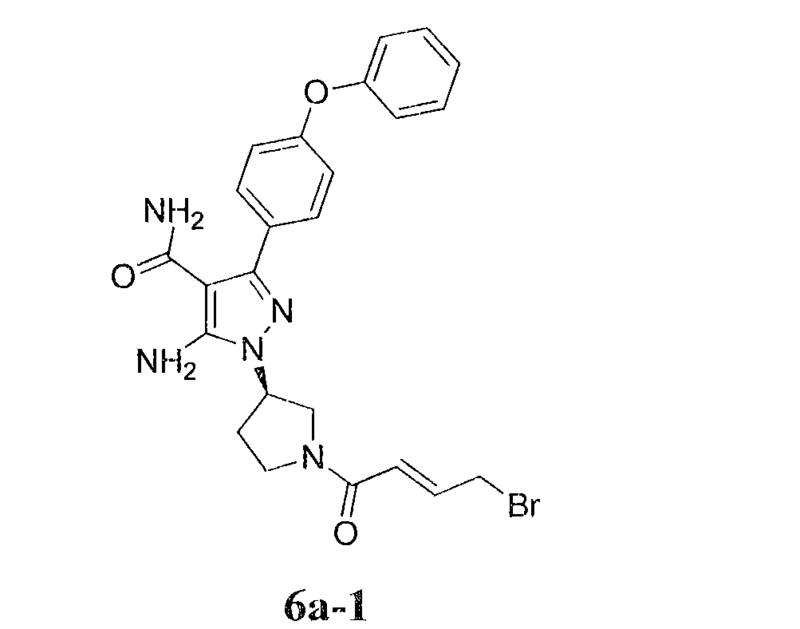 The compound as shown in the formula (I) is a small molecular Bruton's tyrosine kinase (BTK) inhibitor. 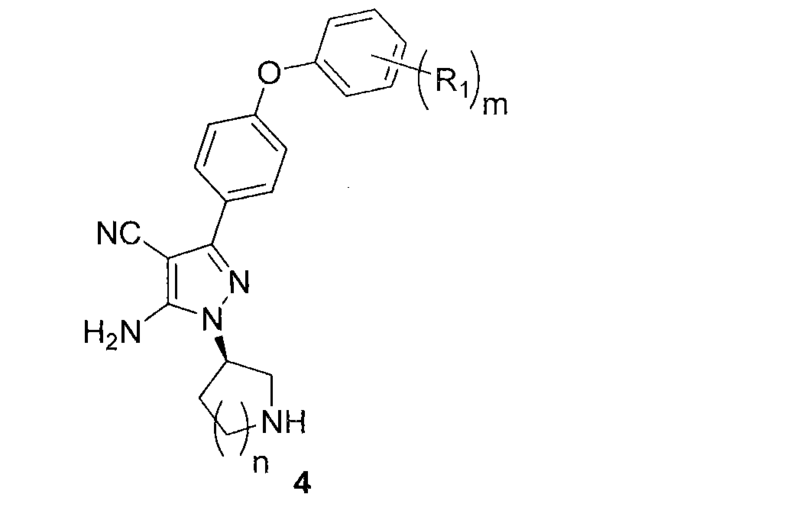 It has been proved that the BTK inhibitor can inhibit chronic lymphocytic leukemia and related diseases. 本发明涉及药物及其药物中间体合成领域，尤其涉及布鲁顿酪氨酸激酶(Bruton' s tyrosine kinase, BTK)激酶抑制剂的制备方法。  The present invention relates to the synthesis of drugs and drug intermediates, and in particular relates to Bruton tyrosine kinase (Bruton 's tyrosine kinase, BTK) preparing kinase inhibitors. 式（I)化合物是一个高选择性小分子布鲁顿酿氨酸激酶（Bruton' s tyrosine kinase，Btk)激酶抑制剂，是慢性淋巴细胞白血病（CLL)治疗的关键靶点。 Compound  Formula (I) is a highly selective small molecule brewing Bruton tyrosine kinase (Bruton 's tyrosine kinase, Btk) kinase inhibitor, is the key target for chronic lymphocytic leukemia (CLL) treatment. Btk抑制剂是一种非受体酪氨酸激酶Tec家族的成员，是在除了T淋巴细胞和自然杀伤细胞之外的所有造血细胞类型中表达的关键信号酶。 Btk inhibitor is a non-member of the Tec family of receptor tyrosine kinases, is a key signaling enzyme expressed in all hematopoietic cells types except T lymphocytes and natural killer cells. Btk在连接细胞表面B细胞受体（B-cell receptor， BCR)刺激至下游细胞内应答的B细胞信号传导途径中扮演至关重要的角色。 Btk plays a crucial role in the pathway connecting the cell surface B-cell receptor (B-cell receptor, BCR) stimulation of B cells into downstream intracellular signal in response. Btk是B细胞发育、激活、信号传导和存活的关键调节物。 Btk is a B-cell development, activation, signaling, and survival key regulator. 另外，Btk在众多其它造血细胞信号传导途径中起作用，例如在巨噬细胞中的Toll样受体（Toll like receptor，TLR)和细胞因子受体介导的TNF-α产生、在肥大细胞中的免疫球蛋白E受体（Fc ε RI)信号传导、在B-谱系淋巴样细胞中抑制Fas/ΑΡΟ-Ι细胞凋亡的信号传导以及胶原刺激的血小板聚集。 In addition, Btk in a number of other hematopoietic cell signaling pathways play a role, for example in macrophages Toll-like receptors (Toll like receptor, TLR) and cytokine receptor-mediated TNF-α production, in mast cells immunoglobulin E receptor (Fc ε RI) signal transduction, inhibition of Fas / platelet aggregation ΑΡΟ-Ι apoptotic cells and collagen-stimulated signaling in B- lymphoid lineage cells. 该方法中采用酯基水解成羧酸，然后经Boc酸酐处理后再成酰胺，最后再脱去Boc 酸酐得到目标产品，该反应操作复杂，收率低。  The method employed in hydrolyzed to carboxylic acid ester group, and the Boc anhydride to an amide and then, finally removal of the Boc anhydride to give the title product, the reaction is complicated operation, low yield. 该方法是采用氰基水解的方法成酰胺，脱保护和氰基的水解同时进行，实验发现该方法存在很多问题，出现很多杂质，而且反应不完全，后处理需要柱层析分离产品。  This method is a method using a cyano group to an amide hydrolysis, deprotection and hydrolysis of a cyano group at the same time, there are many problems was found that this method, a lot of impurities, and the reaction was not complete, the process requires isolation of the product by column chromatography . 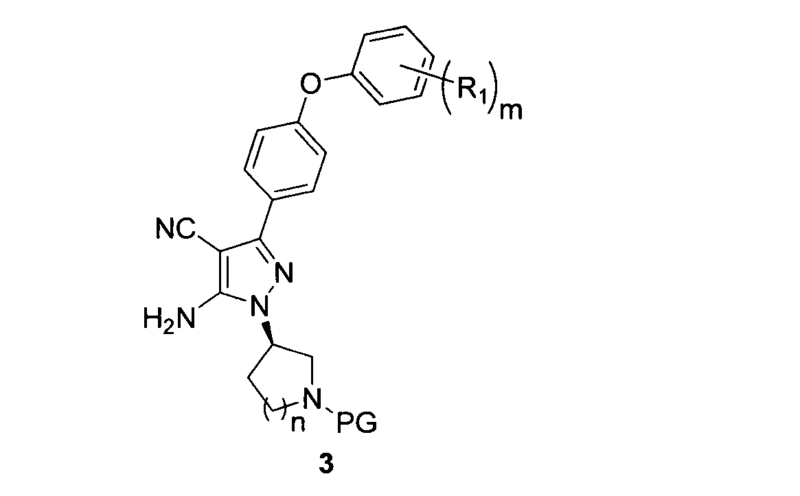 需要制备式（I)化合物和式（5)化合物的新的和有效的方法。  New and effective methods require the preparation of compounds of formula (I) and a compound of formula (5). 除非另有定义，否则本文所有科技术语具有的涵义与权利要求主题所属领域技术人员通常理解的涵义相同。  Unless otherwise defined, all technical and scientific terms herein have the same meaning as the right to the same theme skilled in the art commonly understood meaning of the requirements. 除非另有说明，本文全文引用的所有专利、专利申请、公开材料通过引用方式整体并入本文。 Unless otherwise stated, all patents herein incorporated by reference, patent applications, published materials are incorporated herein by reference in its entirety. 如果本文对术语有多个定义，以本章的定义为准。 If there are multiple definitions of the terms used herein, whichever defined in this chapter. 应理解，上述简述和下文的详述为示例性且仅用于解释，而不对本发明主题作任何限制。  It should be understood, the above description and the following detailed description are exemplary and only serve to explain, without any limitation of the subject matter of the present invention. 在本申请中，除非另有具体说明，否则使用单数时也包括复数。 In this application, unless specifically stated otherwise, also include the plural use of the singular. 还应注意，除非另有说明，否则所用"或"、"或者"表示"和/或"。 It should also be noted that, unless otherwise indicated, used "or", "or" means "and / or." 此外，所用术语"包括"以及其它形式，例如"包含"、"含"和"含有"并非限制性。 Further, the term "comprising" as well as other forms, such as "comprising", "containing" and "comprising" is not limiting. 可在参考文献（包括Carey and Sundberg " ADVANCED ORGANIC CHEMISTRY 4™ED. " 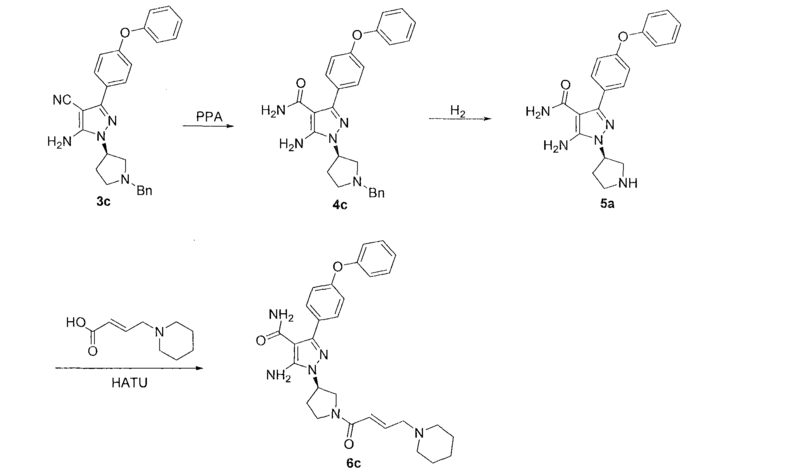 Vols.A(2000)and B(2001)，Plenum Press，New York)中找到对标准化学术语的定义。  Reference may be (including Carey and Sundberg "ADVANCED ORGANIC CHEMISTRY 4 ™ ED." Vols.A (2000) and B (2001), Plenum Press, New York) found in the definitions of standard chemistry terms. 除非另有说明，否则采用本领域技术范围内的常规方法，如质谱、NMR、IR和UV/Vis光谱法和药理学方法。 Unless otherwise indicated, conventional methods within the skill in the art, such as mass spectrometry, NMR, IR and UV / Vis spectroscopy and pharmacology,. 除非提出具体定义，否则本文在分析化学、有机合成化学以及药物和药物化学的有关描述中采用的术语是本领域已知的。 Unless specific definitions proposed otherwise described herein in terms related to the analysis of chemical, pharmaceutical and synthetic organic chemistry and pharmaceutical chemistry are employed known in the art. 可在化学合成、化学分析、药物制备、制剂和递送，以及对患者的治疗中使用标准技术。 It may be chemical syntheses, chemical analyzes, pharmaceutical preparation, formulation, and delivery, and using standard techniques for treatment of patients. 例如，可利用厂商对试剂盒的使用说明，或者按照本领域公知的方式或本发明的说明来实施反应和进行纯化。 For example, using the manufacturer's instructions for using the kit, or in accordance with the description of the invention, or known in the art way to implement the reaction and purification. 通常可根据本说明书中引用和讨论的多个概要性和较具体的文献中的描述，按照本领域熟知的常规方法实施上述技术和方法。 Summary and description of a plurality of more specific literature cited and discussed generally in accordance with the present specification, the above-described methods and techniques in a conventional manner known in the art. 在本说明书中，可由本领域技术人员选择基团及其取代基以提供稳定的结构部分和化合物。 In the present specification, by one skilled in the art to select groups and substituents thereof to provide stable moieties and compounds. 当通过从左向右书写的常规化学式描述取代基时，该取代基也同样包括从右向左书写结构式时所得到的在化学上等同的取代基。  When the substituent by conventional chemical formulas, written from left to right description, the substituent also include the right to left in chemical equivalent substituents writing structural formula obtained. 举例而言，ch 20等同于och2。 For example, ch 20 is equivalent to och2. 本文所用术语"部分"、"结构部分"、"化学部分"、"基团"、"化学基团"是指分子中的特定片段或官能团。  As used herein, the term "portion," "moiety", "chemical moiety", "group", "chemical group" refers to a specific segment or functional group of a molecule. 化学部分通常被认为是嵌入或附加到分子上的化学实体。 Chemical moieties are often considered to be chemical entities embedded in or appended to a molecule. 术语"键"或"单键"是指，通过键使两个原子或两个部分相连得到更大结构部分的化学键。  The term "bond" or "single bond" means that the two atoms by a bond or a chemical bond to give two connected portions of a larger moiety. 本文所用Q n包括Q 2、(； .......Q n。举例而言，所述4"基团是指该部分中具有1-4个碳原子，即基团包含1个碳原子，2个碳原子、3个碳原子或4个碳原子。因此， 举例而言4烷基"是指在有1-4个碳原子的烷基，即所述烷基选自甲基、乙基、丙基、异丙基、正丁基、异丁基、仲丁基和叔丁基。本文中的数字范围，例如"1-10"是指给定范围中的各个整数，例如" 1-10个碳原子"是指该基团可具有1个碳原子、2个碳原子、3个碳原子、4 个碳原子、5个碳原子、6个碳原子、7个碳原子、8个碳原子、9个碳原子或10个碳原子。  As used herein, Q n comprising Q 2, (;. ....... Q n For example, the 4 "group refers to the portion having 1-4 carbon atoms, i.e. the group comprising 1 carbon atom, 2 carbon atoms, 3 carbon atoms or 4 carbon atoms. Thus, for example alkyl "refers to an alkyl group having 1 to 4 carbon atoms, i.e. the alkyl group is selected from methyl, ethyl, propyl, isopropyl, n-butyl, isobutyl, sec-butyl and t-butyl. herein, a numerical range such as "1 to 10" refers to each integer in the given range , such as "1 to 10 carbon atoms" means that the group may have 1 carbon atom, 2 carbon atoms, 3 carbon atoms, 4 carbon atoms, 5 carbon atoms, 6 carbon atoms, 7 carbon atoms, 8 carbon atoms, 9 carbon atoms, or 10 carbon atoms. 本文单独或组合使用的术语"烷基"是指任选取代的直链或任选取代的支链的一价饱和烃。  alone or in combination herein, the term "alkyl" refers to a monovalent optionally substituted straight or branched optionally substituted saturated hydrocarbon. 本文的"烷基"可具有1-约6个碳原子，例如具有1-约6个碳原子，优选1-约3个碳原子。 "Alkyl" herein may have from 1 to about 6 carbon atoms, for example having 1 to about 6 carbon atoms, preferably 1 to about 3 carbon atoms. 本文的烷基实例包括但不限于甲基、乙基、正丙基、异丙基、2-甲基-1-丙基、 2-甲基-2-丙基、2-甲基-1-丁基、3-甲基-1-丁基、2-甲基-3-丁基、2,2_二甲基-1-丙基、2-甲基-1-戊基、3-甲基-1-戊基、4-甲基-1-戊基、2-甲基-2-戊基、3-甲基-2-戊基、4 -甲基戊基、2, 2- 一甲基-1-丁基、3, 3- 一甲基-1-丁基、2_乙基_1_ 丁基、ΪΗ丁基、异丁基、仲丁基、叔丁基、正戊基、异戊基、新戊基、叔戊基和己基等。 Examples of alkyl groups herein include, but are not limited to, methyl, ethyl, n-propyl, isopropyl, 2-methyl-1-propyl, 2-propyl, 2-methyl- butyl, 3-methyl-1-butyl, 2-methyl-3-butyl, 2,2_-dimethyl-1-propyl, 2-methyl-1-pentyl, 3-methyl 1-pentyl, 4-methyl-1-pentyl, 2-methyl-2-pentyl, 3-methyl-2-pentyl, 4 - methylpentyl, 2-methyl-2- 1-butyl, 3, 3-methyl-1-butyl, butyl _1_ 2_ ethyl, ΪΗ butyl, isobutyl, sec-butyl, tert-butyl, n-pentyl, isopentyl group, neopentyl, tert-pentyl and hexyl groups and the like. 本文定义的基团，如"烷基"出现数字范围时，例如烷基"或6烷基"是指可由1个碳原子、2个碳原子、 3个碳原子、4个碳原子、5个碳原子或6个碳原子构成的烷基，本文的烷基也包含未指定数字范围的情况。 When a group as defined herein, such as "alkyl" appears numerical range, e.g. alkyl "or 6 alkyl" refers to a carbon atom by 1, 2 carbon atoms, 3 carbon atoms, 4 carbon atoms, 5 alkyl, herein carbon atoms or 6 carbon atoms are also included without specified numerical range. 本文组合使用的"烷基"包括与其他基团结合的烷基，例如烷氧基中的烷基、单烷基氨基、二烷基氨基中的"烷基"等。  The compositions used herein, "alkyl" includes alkyl groups in combination with other groups, for example alkoxy-alkyl, monoalkylamino, dialkylamino "alkyl" and the like. 本文单独或组合使用的术语"卤代"是指任选被取代的基团的其中一个或多个氢原子被替换成氟、氯、溴、碘原子或其组合。  alone or in combination herein, the term "halo" refers to optionally substituted groups in which one or more hydrogen atoms are replaced by fluorine, chlorine, bromine, iodine atom or a combination thereof. 在一些实施方式中，使用彼此相同的卤素原子替换两个或多个氢原子（例如二氟甲基、三氟甲基）；在其它实施方式中使用彼此并不完全相同的卤素原子替换两个或多个氢原子（例如1-氯-1-氟-1-碘乙基）。 In some embodiments, the same halogen atoms replace one another two or more hydrogen atoms (e.g. difluoromethyl, trifluoromethyl); alternatively use two halogen atoms are not identical to each other in other embodiments or more hydrogen atoms (such as 1-chloro-1-fluoro-1-iodoethyl). 卤代烷基的非限定性实例为氟甲基和溴乙基。 Non-limiting examples of haloalkyl groups are fluoromethyl and bromoethyl. 本文单独或组合使用的术语"卤素"、"卤代"或"卤化物"是指氟、氯、溴和碘。  alone or in combination herein, the term "halogen", "halo" or "halide" refers to fluoro, chloro, bromo and iodo. 本文单独或组合使用的术语"烷氧基"是指烷基醚基（0-烷基），并且其中的术语烷基如上文的定义。  alone or in combination herein, the term "alkoxy" refers to an alkyl ether group (O-alkyl), and wherein the term alkyl is as defined above. 烷氧基的非限定性实例包括甲氧基、乙氧基、正丙氧基、异丙氧基等。 Non-limiting examples of alkoxy groups include methoxy, ethoxy, n-propoxy, isopropoxy and the like. 本文使用的术语"单烷基氨基"是指_NHRa基团，其中Ra是以上定义的烷基。  As used herein, the term "monoalkylamino" refers to a group _NHRa wherein Ra is alkyl as defined above. 单烷基氨基的非限定性实例包括甲基氨基、乙基氨基、异丙基氨基等。 Non-limiting examples of the monoalkylamino include methylamino, ethylamino, isopropylamino and the like. 本文使用的术语"双烷基氨基"、"二烷基氨基"是指_NRaRb基团，其中R a和Ra是以上定义的独立烷基。  The term used herein, "dialkylamino", "dialkylamino" means a radical _NRaRb, wherein R a and Ra is independently an alkyl group defined above. "双烷基氨基"、"二烷基氨基"的非限定性实例包括二甲基氨基、二乙基氣基、一丙基氨S、甲基乙基氨1基等。 "Dialkylamino", "dialkylamino" Non-limiting examples include dimethylamino, diethylamino gas group, an amino propyl S, 1-methyl-ethylamino group and the like. 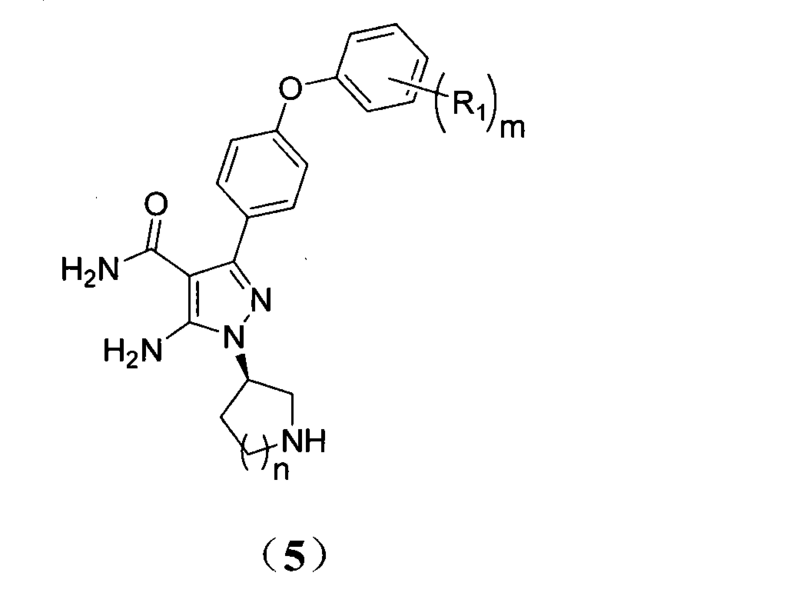 (c)式4化合物在酸性条件下将氰基水解为酰胺，得到式5化合物。  (c) a compound of formula 4 under acidic conditions cyano group to an amide hydrolysis, to give a compound of formula 5. 或先将式3化合物进行氰基水解成酰胺，得到式7化合物，然后再脱去PG保护基， 得到式5化合物。  or a compound of formula 3 is first hydrolyzed to the amide cyano, to give a compound of formula 7, and then removing the protective group PG, to give a compound of formula 5. R3为苯磺酰基（Ts)、甲磺酰基（Ms)、对甲苯磺酰基、或对氯苯磺酰基。  R3 is phenylsulfonyl (Ts of), methanesulfonyl group (of Ms), p-toluenesulfonyl, methanesulfonyl or p-chlorophenyl group. 在本发明的另一些实施方案中，R3选自对甲苯磺酰基或对氯苯磺酰基，步骤（a)所述的碱选自碳酸钾、碳酸铯、叔丁醇钾、叔丁醇钠等。  In other embodiments of the present invention, R3 is selected from p-toluenesulfonyl or p-chlorobenzenesulfonyl, step (a) the base is selected from potassium carbonate, cesium carbonate, potassium tert-butoxide, tert-butyl sodium alcohol. 在本发明的一些实施方案中，上述式4和式7所示化合物中的PG为叔丁氧基羰基或苄基。  In some embodiments of the present invention, the above-described compounds of Formula 4 and Formula 7 PG is tert-butoxycarbonyl or benzyl. 在本发明的方法的一个实施方式中，步骤（a)中所用0R3为常用的离去基团，其中R3为苯磺酰基（Ts)、甲磺酰基（Ms)、对甲苯磺酰基、对氯苯磺酰基等。  In one embodiment of the method of the present invention, step (a) is used 0R3 commonly used leaving groups, wherein R3 is phenylsulfonyl (Ts of), methanesulfonyl group (of Ms), p-toluenesulfonyl , p-chlorophenyl sulfonyl group. PG为胺基的常用保护基，如叔丁氧基羰基（Boc)、三苯甲基（Trt)、苄基（Bn)及对甲氧基苄基（PMB)等。 PG is a common amine protecting group such as t-butoxycarbonyl (Boc), trityl (Trt), benzyl (Bn) group and p-methoxybenzyl (PMB) and the like. 该反应一般在碱性条件下进行，所用碱选自但不限于：碳酸钠、碳酸钾、碳酸铯，氢氧化钠、氢氧化锂、 叔丁醇钾、叔丁醇钠或它们的组合，优选为碳酸铯；反应中所用的溶剂选自但不限于：DMF、 DMS0、NMP、二氧六环、甲苯、乙腈或它们的组合，优选为DMF或NMP。 The reaction is generally carried out under basic conditions, the base is selected from, but not limited to use: sodium carbonate, potassium carbonate, cesium carbonate, sodium hydroxide, lithium hydroxide, potassium tert-butoxide, sodium tert-butoxide, or a combination thereof, preferably cesium carbonate; the reaction solvent used is selected from but not limited to: DMF, DMS0, NMP, dioxane, toluene, acetonitrile, or a combination thereof, preferably DMF or NMP. 反应温度为0-190°C，优选为80-120°C。 The reaction temperature is 0-190 ° C, preferably 80-120 ° C.
 在本发明的方法的一个实施方式中，步骤（b)中所述PG为胺基的常用保护基如叔丁氧基羰基、三苯甲基、苄基、对甲氧基苄基等；其中当PG为苄基时在酸性条件下脱去保护基，例如氯化氢气体、盐酸或三氟乙酸等，当PG为苄基或对甲氧基苄基时，采用的脱保护方法为加氢或用三氟乙酸；反应中所用的溶剂选自，但不限于二氯甲烷、二氯乙烷、乙酸乙酯、 甲醇、乙醇或它们的组合。  In one embodiment of the method of the present invention, the step (b) said amine group PG is a conventional protecting group such as tert-butoxycarbonyl, trityl, benzyl, p-methoxybenzyl and the like; wherein PG is a benzyl group when the protecting group is removed under acidic conditions, for example hydrogen chloride gas, hydrochloric acid or trifluoroacetic acid and the like, when PG is benzyl or p-methoxybenzyl, deprotection methods employed to increase with trifluoroacetic acid or hydrogen; the solvent used in the reaction is selected from, but not limited to dichloromethane, dichloroethane, ethyl acetate, methanol, ethanol, or combinations thereof. 在本发明的方法的一个实施方式中，步骤（c)中所述的氰基在酸性条件下水解为酰胺，所采用的酸选自但不限于盐酸、醋酸、多聚磷酸或其与水的混合物等，优选为多聚磷酸或多聚磷酸与水的混合物；反应温度为0-150°C，优选为80-120°C ;反应时间为3-24小时，优选为3-10小时。  In one embodiment of the method of the present invention, the step (c) in the cyano group is hydrolyzed under acidic conditions amide acid employed is selected from but are not limited to, hydrochloric acid, acetic acid, or a polyphosphoric acid and mixtures of water and the like, preferably a multi-mixture of polyphosphoric acid or polyphosphoric acid with water; reaction temperature is 0-150 ° C, preferably 80-120 ° C; the reaction time is 3-24 hours, preferably 3-10 hour. 在本发明的方法的一个实施方式中，步骤（d)中所用的成酰胺的方法为式6化合物的酰氯、酸酐或用缩合剂直接和式6化合物缩合成酰胺，优选为式6化合物的酰氯或酸酐；其中缩合剂选自N，N-二异丙基碳二亚胺（DIC)、N，N-二环己基碳二亚胺（DCC)、1-乙基-3-(3-二甲氨丙基）碳二亚胺盐酸盐（EDCI)、N-羟基苯并三唑（HOBt)、6_氯苯并三氮唑-1，1，3,3-四甲基脲六氟磷酸酯（HCTU)、2-(7-偶氮苯并三氮唑）-N，N，N'，N'-四甲基脲六氟磷酸酯（HATU)或其任意组合等。  In one embodiment of the method of the present invention, the process step (d) used in an amide of the acid chloride of formula 6 compounds, acid anhydride or condensed amide compound a condensing agent directly and Formula 6, preferably of formula 6 acid chloride or anhydride compound; wherein the condensing agent is selected from N, N- diisopropyl carbodiimide (DIC), N, N- dicyclohexyl carbodiimide (DCC), 1- ethyl-3- ( 3-dimethylaminopropyl) carbodiimide hydrochloride (EDCI), N- hydroxybenzotriazole (HOBt), 6_ chlorobenzene and 1,1,3,3-tetramethyl-triazole hexafluorophosphate (HCTU), 2- (7- benzotriazole azo) -N, N, N ', N'- tetramethyluronium hexafluorophosphate (HATU), or any combination thereof. 以下将结合实施例对本发明的制备方法进行更详细的描述。  The following embodiments in conjunction with the preparation method of the present invention will be described in more detail. 然而，本领域技术员应当理解，以下实施例仅是为了说明的目的，而非对本发明的限定。 However, those skilled technician should be understood, the following examples are merely for purposes of illustration, not limitation of the invention. 本发明的保护范围应当由所附的权利要求书来限定。 Scope of the invention should be determined by the appended claims is defined. 向一个干燥的10L三口瓶中依次加入化合物la(600g，2. 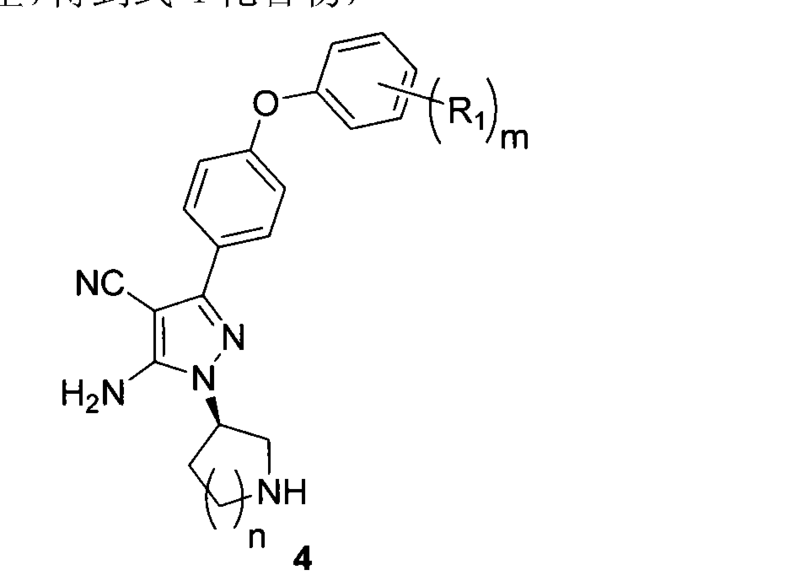 17mol)，化合物2a(815g， 2.39mol)，粉末状碳酸铯（1417g，4.35mol)和N，N-甲基甲酰胺（DMF，6L)，机械搅拌，加热内温升至80°C (约需1. 5小时），2小时后送HPLC监控反应，反应完毕，停止加热，冷却至室温，再加入10L乙酸乙酯和15L水，搅拌30分钟（转速200)，静置，分液，水相弃去，有机相用lkg无水硫酸钠机搅干燥，过滤，滤液浓缩得深红棕色油状物，该粗品用二氧六环重结晶二次，得淡黄色粉末状固体450g，收率46. 4%。  sequentially added Compound la (600g, 2. 17mol) 10L to a dry three-neck flask, Compound 2a (815g, 2.39mol), powdered cesium carbonate (1417g, 4.35mol) and N, N- dimethylformamide amides (DMF, 6L), mechanically stirred, the heating temperature was raised to 80 ° C (takes about 1.5 hours), 2 hours reaction was monitored evacuation HPLC, the reaction was completed, heating was stopped, cooled to room temperature, ethyl acetate was added 10L esters and 15L of water, stirred for 30 minutes (speed 200), allowed to stand and partitioned, the aqueous phase was discarded and the organic phase was dried over anhydrous sodium lkg stirring machine sulfate, filtered and concentrated to give dark red-brown oil, the crude product was secondary recrystallized from dioxane to give 450 g of a pale yellow powdered solid, a yield of 46.4%. 向干燥的10L三口瓶中加入化合物3a(463g)，二氯甲烷6L，待溶解后，冰水浴降温至5°C，通入干燥的HC1气体1小时，然后搅拌过夜。  To a dry three-neck flask was added 10L compound 3a (463g), 6L methylene chloride, to be dissolved, ice water bath cooling to 5 ° C, leads to a dry HC1 gas for 1 hour and then stirred overnight. 抽滤，用二氯甲烷1L洗涤一次，晾干， 得385g淡黄色粉末状固体（97. 0% )。 Filtered off with suction, washed once with 1L of methylene chloride, dried to give 385g as a pale yellow powder (97.0%). 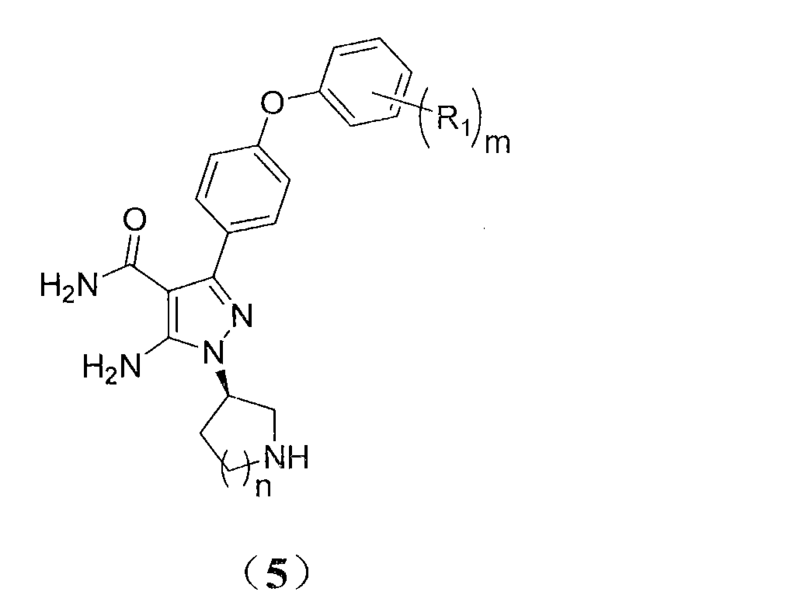 4 NMR(400MHz，DMS0) : δ 9. 36-9. 67 (2H，brs)，7. 86 (2H，d，J = 8· 8HZ)，7. 40 (2H， t, J = 8. 0Hz), 7. 16 (1H, t, J = 7. 6Hz), 7. 08 (2H, d, J = 8. 8Hz), 7. 04 (2H, d, J = 8. 0Hz), 6. 94 (2H, s), 5. 10-5. 13 (1H, m), 3. 39-3. 58 (4H, m), 2. 25-2. 34 (1H, m), 2. 13-2. 20 (1H, m). 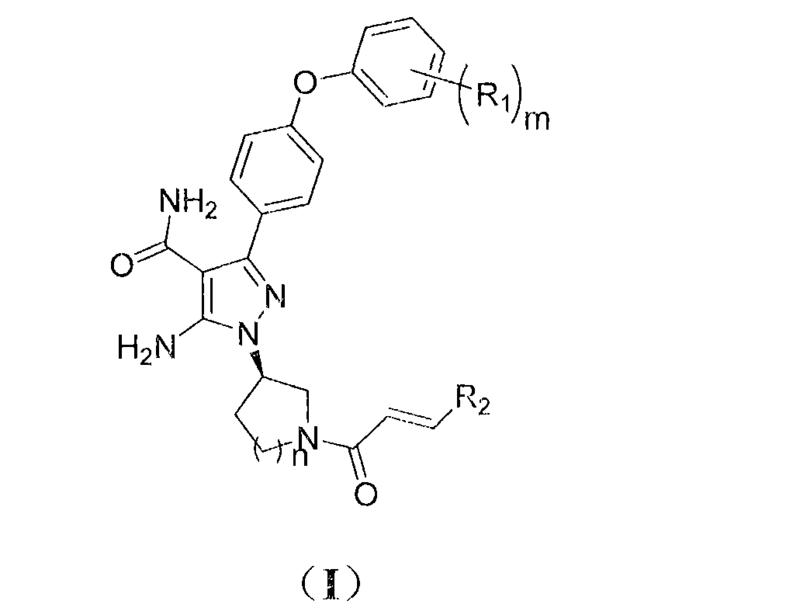 4 NMR (400MHz, DMS0):... Δ 9. 36-9 67 (2H, brs), 7 86 (2H, d, J = 8 · 8HZ), 7 40 (2H, t, J = 8. 0Hz), 7. 16 (1H, t, J = 7. 6Hz), 7. 08 (2H, d, J = 8. 8Hz), 7. 04 (2H, d, J = 8. 0Hz), 6. 94 (2H, s), 5. 10-5. 13 (1H, m), 3. 39-3. 58 (4H, m), 2. 25-2. 34 (1H, m), 2. 13-2. 20 (1H, m). 4匪1? (400 MHz, CDC13) : δ 7. 49(2H，d，J = 8. 4Hz)，7· 35(2H，t，J = 7. 6Hz)， 7. 13(lH，t，J = 7. 6Hz)，7. 06(2H，d，J = 8. 4Hz)，7. 04(2H，d，J = 7. 6Hz)，6. 78(2H， s)，5. 06-5. 26 (2H，brs)，4. 83-4. 87 (1H，m)，3. 43 (1H，d，J = 7. 2Hz)，3. 38 (1H，td，J = 9. 6Hz，2. 8Hz)，3. 11 (1H，d，J = 7. 2Hz)，3. 09 (1H，d，J = 7. 2Hz)，2. 83 (1H，q，J = 8. 8Hz)， 2. 32-2. 40 (1H, m), 2. 11-2. 20 (1H, m). 4 bandit 1 (400 MHz, CDC13):? Δ 7. 49 (2H, d, J = 8. 4Hz), 7 · 35 (2H, t, J = 7. 6Hz), 7. 13 (lH , t, J = 7. 6Hz), 7. 06 (2H, d, J = 8. 4Hz), 7. 04 (2H, d, J = 7. 6Hz), 6. 78 (2H, s), 5 . 06-5. 26 (2H, brs), 4. 83-4. 87 (1H, m), 3. 43 (1H, d, J = 7. 2Hz), 3. 38 (1H, td, J = 9. 6Hz, 2. 8Hz), 3. 11 (1H, d, J = 7. 2Hz), 3. 09 (1H, d, J = 7. 2Hz), 2. 83 (1H, q, J = 8 . 8Hz), 2. 32-2. 40 (1H, m), 2. 11-2. 20 (1H, m). 在一个干燥的2L三口瓶中依次加入4-甲氧基巴豆酸（52.28,0.45!11〇1)，11^二氯甲烷，磁力搅拌，待溶解后加入草酰氯（57. 2g，0. 45mol)，冰浴降温至内温5°C (氮气保护）， 加入3滴N，N-二甲基甲酰胺（DMF)，反应引发，大量气体放出，半小时后撤去冰浴，继续在室温搅拌至没有气体放出，约4~5小时。  Chiba beans were successively added 4-methoxy acid (52.28,0.45! 11〇1) In a dry 2L three-necked flask, 11 ^ dichloromethane, magnetic stirring, was added oxalyl chloride to be dissolved (57. 2g, 0. 45mol), cooled to ice bath temperature within 5 ° C (nitrogen), was added 3 drops of N, N- dimethylformamide (DMF), the reaction initiator, a large number of gas evolution, ice bath was removed half an hour, continued It was stirred at room temperature until gas evolution ceased, about 4 to 5 hours. 充分浓缩，除去溶剂，得到浅黄色油状液体，溶于500mL二氯甲烷转移入恒压漏斗中待用。 Sufficiently concentrated, the solvent was removed to give a pale yellow oily liquid was dissolved in 500mL of dichloromethane was transferred into a constant pressure funnel stand. 在一个干燥的5L三口瓶中依次加入化合物5a(174g，0. 48mol)，1. 5L二氯甲烷和0此4(938,0.72!11〇1)，待溶解后降温至内温-51：(冰盐浴，氮气保护）。  successively added in a dry three-necked flask of 5L compound 5a (174g, 0. 48mol), 1. 5L of methylene chloride and 0 4 of this (938,0.72! 11〇1), after cooling to the internal temperature to be dissolved -51 :( ice-salt bath, nitrogen). 用恒压漏斗慢速加入上述新制备的4-甲氧基巴豆酸的酰氯溶液，用时1. 5小时。 Freshly prepared above acid chloride solution was added slowly with constant pressure funnel beans acid 4-methoxy Chiba, when using 1.5 hours. 加完后继续反应1小时。 After the addition reaction was continued for 1 hour. 送HPLC监控反应，反应完毕，反应瓶中加入1L水，搅拌1小时，转移入5L分液漏斗中，分出有机相，用饱和柠檬酸溶液（1L)洗涤一次，水洗两次（2L/次），250g无水硫酸钠机搅干燥5 小时，过滤，滤液浓缩，粗品用乙酸乙酯打浆处理，得到化合物6a(130g，58. 7% )，HPLC纯度为98. 5%。 Send HPLC monitoring of the reaction, the reaction is completed, the reaction flask was added 1L of water, stirred for 1 hour, transferred into 5L separatory funnel, the organic phase was separated, washed with saturated citric acid solution (1L), washed once, washed twice with water (2L / time ), 250 g of anhydrous sodium sulfate machine stirred for 5 hours and filtered, the filtrate was concentrated, the crude product is treated with ethyl acetate beating, to give compound 6a (130g, 58. 7%), HPLC purity 98.5%. 实施例5的合成通过使用化合物5a和4-溴巴豆酸，类似于实施例4中所述的步骤来完成。  Synthesis Example 5 by using compound 5a and 4-bromo crotonic acid, similar to the procedure of Example 4 described in the embodiments to complete. 4 MMR(400 MHz，CDC13) δ 7. 48-7. 50(m，2H)，7. 35-7. 39(m，2H)，7· 14-7. 18(m， 1H)，7· 69-7. 09 (m，5H)，6· 34 (dd，J = 10. 8, 22. 0Hz，1H)，5· 2-5. 6 (brs，4H)，4· 61-4. 73 (m， 1H)，3. 90-4. 12 (m，5H)，3. 62-3. 76 (m，1H)，2. 30-2. 78 (m，2H) · m/z = 510 [M+l]+。  4 MMR (400 MHz, CDC13) δ 7. 48-7. 50 (m, 2H), 7. 35-7. 39 (m, 2H), 7 · 14-7. 18 (m, 1H) , 7 · 69-7. 09 (m, 5H), 6 · 34 (dd, J = 10. 8, 22. 0Hz, 1H), 5 · 2-5. 6 (brs, 4H), 4 · 61- 4. 73 (m, 1H), 3. 90-4. 12 (m, 5H), 3. 62-3. 76 (m, 1H), 2. 30-2. 78 (m, 2H) · m / z = 510 [M + l] +. 在一个干燥的10L三口瓶中依次加入化合物5b(413g，1.0mol)，4L二氯甲烷和二异丙基乙胺（DIEA) (323g，2. 5mol)，待溶解后降温至内温-20°C。  sequentially added Compound 5b (413g, 1.0mol) in a dry three-necked flask of 10L, 4L of dichloromethane and diisopropylethylamine (DIEA) (323g, 2. 5mol), to be dissolved into the cooled temperature -20 ° C. 用恒压漏斗慢速滴加丙烯酸酐（126g，1. Omol)和二氯甲烷（1L)的混合液，用时1. 5小时。 Solution of acrylic anhydride (126g, 1. Omol) and methylene chloride (1L) with a slow constant pressure funnel mixture with a time 1.5 hours. 加完后继续反应1小时。 After the addition reaction was continued for 1 hour. 送HPLC监控反应，反应完毕，反应瓶中加入2L水，搅拌1小时，放出有机相，用饱和柠檬酸溶液（2L)洗涤一次，水洗两次（2L/次），无水硫酸钠机搅干燥，过滤，滤液浓缩，粗品用乙酸乙酯打浆，得到化合物6b (242g，51. 8% )，HPLC纯度为98. 5%。 Send HPLC monitoring of the reaction, the reaction is completed, the reaction flask was added 2L of water, stirred for 1 hour, discharged organic phase was washed with saturated citric acid solution (2L) washed once washed twice with water (2L / time), dried over anhydrous sodium sulfate stirring machine The filtrate was concentrated and the crude product was slurried in ethyl acetate, to give compound 6b (242g, 51. 8%), HPLC purity 98.5%. 4 NMR(300MHz，CDC13) δ 7. 56(dd，J = 8· 6,2· 8Hz，2H)，7. 13(dd，J = 8· 6,3· 0Hz， 2H)，6· 53-6. 61 (m，3H)，6· 37-6. 47 (m，2H)，5· 67-5. 74 (m，1H)，5· 58-5. 61 (d，2H)，5· 25 (brs， 2H)，4· 66-4. 77 (m，1H)，3· 92-4. 07 (m，3H)，3· 64-3. 74 (m，1H)，1· 55-2. 15 (m，4H) · m/z = 468[M+1] +。  4 NMR (300MHz, CDC13) δ 7. 56 (dd, J = 8 · 6,2 · 8Hz, 2H), 7. 13 (dd, J = 8 · 6,3 · 0Hz, 2H), 6 · 53-6. 61 (m, 3H), 6 · 37-6. 47 (m, 2H), 5 · 67-5. 74 (m, 1H), 5 · 58-5. 61 (d, 2H) , 5 · 25 (brs, 2H), 4 · 66-4. 77 (m, 1H), 3 · 92-4. 07 (m, 3H), 3 · 64-3. 74 (m, 1H), 1 · 55-2. 15 (m, 4H) · m / z = 468 [m + 1] +. 在一个干燥的氢化藎中依次加入化合物4c (45. 3g，0· lmol)，500mL乙醇和把碳(10%，3. 0g)，通入氢气排空3次，通入氢气，升至5. 0大气压加氢反应12小时，抽滤除去钯碳，滤液浓缩得化合物5a，几乎定量收率。  In a dried successively added Jin hydrogenated compound 4c (45. 3g, 0 · lmol), 500mL of ethanol, and the carbon (10%, 3. 0g), introducing hydrogen evacuated three times, into hydrogen, hydrogenation was raised to 5.0 atmospheres for 12 hours, filtered to remove palladium on carbon, the filtrate was concentrated to give compound 5a, virtually quantitative yield. PG选自叔丁氧基羰基（Boc)、三苯甲基（Trt)、苄基（Bn)和对甲氧基苄基（PMB)，R1和m的定义与以上相同， 在适当条件下脱去保护基·彳县刹式4仆合物. PG is selected from t-butoxycarbonyl (Boc), trityl (Trt), benzyl (Bn) and p-methoxybenzyl (PMB), R1 and m are defined the same as above, under appropriate conditions de County to protect Ricky left foot brake servant compound of formula 4. (C)式4化合物在酸性条件下将氰基水解为酰胺，得到式5化合物。 Compound (C) In formula 4-cyano hydrolysis under acidic conditions to the amide, to give a compound of formula 5. 2. 权利要求1所述方法，其中R1选自氢、卤素。 2. The method as claimed in claim 1, wherein R1 is selected from hydrogen, halogen. 3. 权利要求1-2任一项所述方法，其中，步骤（b)中所述脱保护的条件为氯化氢气体或盐酸去Boc或氢化去苄。 3. The method according to any one of the claims 1-2, wherein step (b) said deprotection conditions Boc or hydrogenated to hydrogen chloride gas or hydrochloric acid to benzyl. 4. 权利要求1-3任一项所述方法，其中，步骤（c)中所述的酸性条件为多聚磷酸（PPA) 或多聚磷酸与水的混合物。 The method according to any one of claims 1-3, wherein step (c) in the acidic conditions of polyphosphoric acid (PPA) or multimeric mixture of phosphoric acid and water. R1，为氢或卤素； m 为0,1，或2 ; η为1或2 ; R2选自氢、C13烷基，卤代C13烷基，C13烷氧基-甲基，羟基-甲基、单C 13烷基氨基-甲基、双C13烷基氨基-甲基、哌啶基-甲基。 R1, is hydrogen or halogen; m is 0, 1, or 2; η is 1 or 2; R2 is selected from hydrogen, C13 alkyl, C13 haloalkyl group, C13 alkoxy - group, a hydroxy - methyl, mono C 13 alkylamino - methyl, bis C13 alkylamino - methyl, piperidinyl - methyl. 6. 权利要求1-5任一项所述方法，其中R2选自氢、甲基、卤代甲基、甲氧基-甲基、羟基-甲基、哌啶基-甲基。 6. A method according to any one of the claims 1-5, wherein R2 is selected from hydrogen, methyl, halomethyl, methoxy - methyl, hydroxy - methyl, piperidinyl - methyl. 7. 权利要求1-6任一项所述方法，其中，步骤（d)中式5化合物与式6化合物的酰氯或酸酐反应，得到式（I)化合物。 The method according to any one of claims 1 to 6, wherein step (d) the compound of formula 5 with acid chloride or anhydride of formula 6 compound of formula (I) compound. R1为氢或卤素； m 为0,1，或2 ; η为1或2 ; PG为叔丁氧基撰基或苄基； R3为苯磺酰基（Ts)、甲磺酰基（Ms)、对甲苯磺酰基、或对氯苯磺酰基。 R1 is hydrogen or halo; m is 0, 1, or 2; η is 1 or 2; PG is a tert-butoxy essays or benzyl; R3 is phenylsulfonyl (Ts of), methanesulfonyl group (of Ms), of tosyl group, a sulfonyl group or p-chlorophenyl. 9. 根据权利要求8所述的方法，其中，R1选自对甲苯磺酰基或对氯苯磺酰基，步骤（a) 所述的碱选自碳酸钾、碳酸铯、叔丁醇钾、叔丁醇钠等。 9. The method of claim 8, wherein, Rl is selected from p-toluenesulfonyl or p-chlorobenzenesulfonyl, step (a) the base is selected from potassium carbonate, cesium carbonate, potassium tert-butoxide, tert-butyl sodium alcohol. 10. 权利要求8-9任一项所述方法，其中，PG为叔丁氧基羰基或苄基。 10. The method according to any one of claims 8-9, wherein, PG is a tert-butoxycarbonyl group or a benzyl group. 其中， R1选自氢或卤素； PG为叔丁氧基羰基、三苯甲基、苄基或对甲氧基苄基； m选自0，1，或2 ; η选自1或2。 Wherein, Rl is selected from hydrogen or halogen; the PG is t-butoxycarbonyl, trityl, benzyl or p-methoxybenzyl; m is selected from 0, 1, or 2; [eta] is selected from 1 or 2. 12. 权利要求11所述化合物，其中PG为叔丁氧基羰基或苄基。 12. The compound as claimed in claim 11, wherein PG is a tert-butoxycarbonyl group or a benzyl group. ES2327760T3 (en) 2009-11-03 Aryl compounds heteroaryl amide ortho. 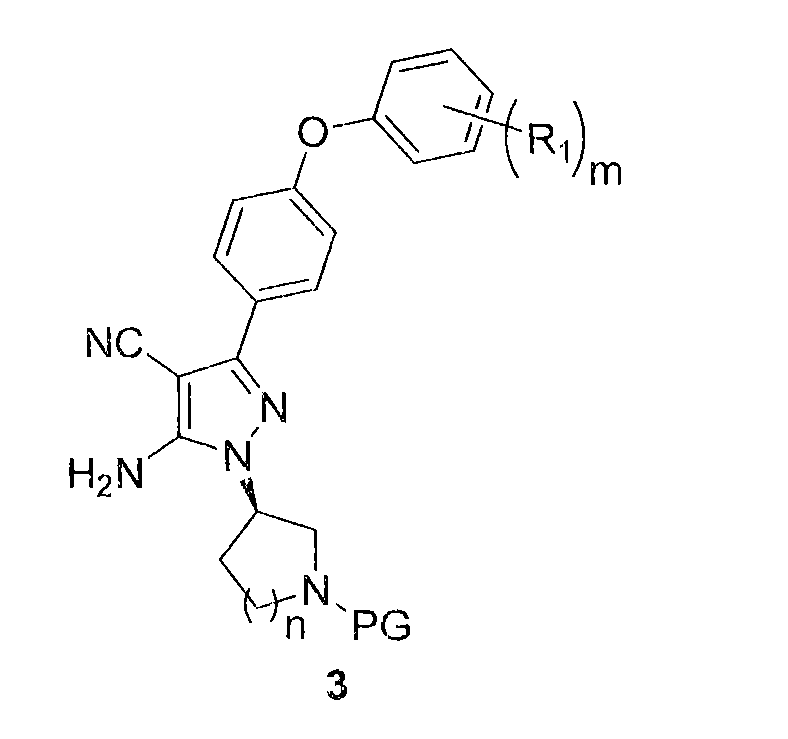 ES2366375T3 (en) 2011-10-19 Oxindole derivatives as agonists of the 5-HT4.